Make smarter inventory and marketing decisions. 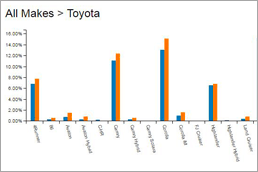 Understand which makes and models are receiving the most page views versus how many you have in stock in a simple, side-by-side column graph. 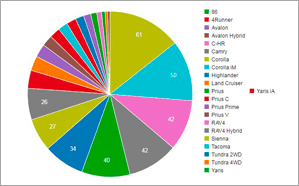 View your current new and used inventory mix broken out by make and model in an easy-to-understand pie chart. 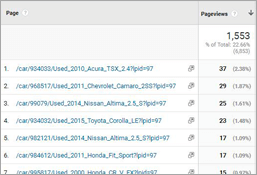 Identify which specific VINs are receiving the most attention from car shoppers in an easy-to-read list format. 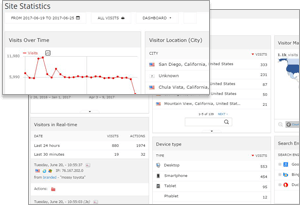 Monitor your website with real-time reports that show how many visitors are on your site, where they’re coming from, what they’re doing, and more. Need help making sense of these reports? 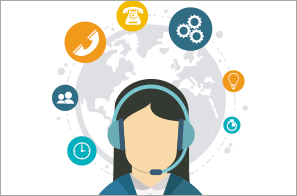 Your dedicated Customer Success Manager is available for one-on-one expert assistance when you need it. Schedule a demo to talk to a CX specialist about your website needs.